Cordial greetings to you in the precious Name of our Lord Jesus Christ. 2011 in the CLCI. We praise God for enabling us to have wonderful and blessed time with Bro. 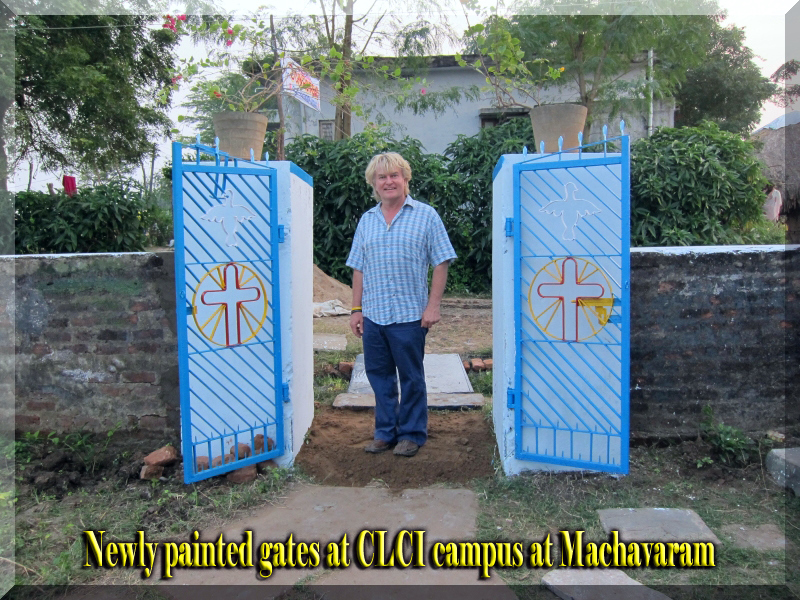 John in visiting few CLCI congregations and gave assistance and undertake some of the church construction programs. Bro. John’s trip to the CLCI congregations has been well accepted and the members of the CLCI appreciated and thanked Bro. John for his wonderful services to the CLCI churches. This is the seventh time that Bro. John visits the CLCI. He was well known and remembered by many of the senior CLCI members. 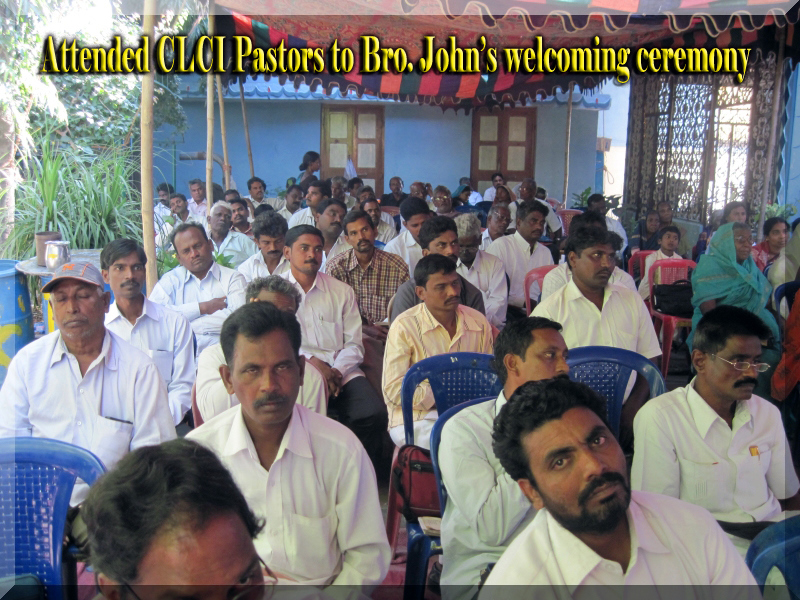 Many of the pastors and members came to the CLCI mission campus and voluntarily attended the welcoming ceremony to meet Bro. John personally. Rev. V.S.Benjamin felt very happy to see Bro. John after 14 years. We are glad to report that Bro. 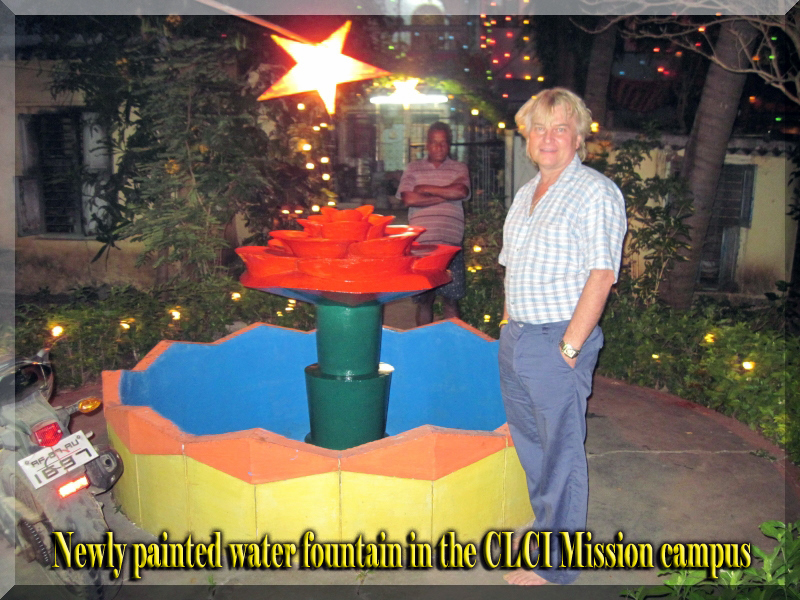 John came to the CLCI with dedication and with great commitment to serve the CLCI from different angles like – Children, poor pastors and students, Widows Care and Church constructions, etc. It was so nice of Bro. 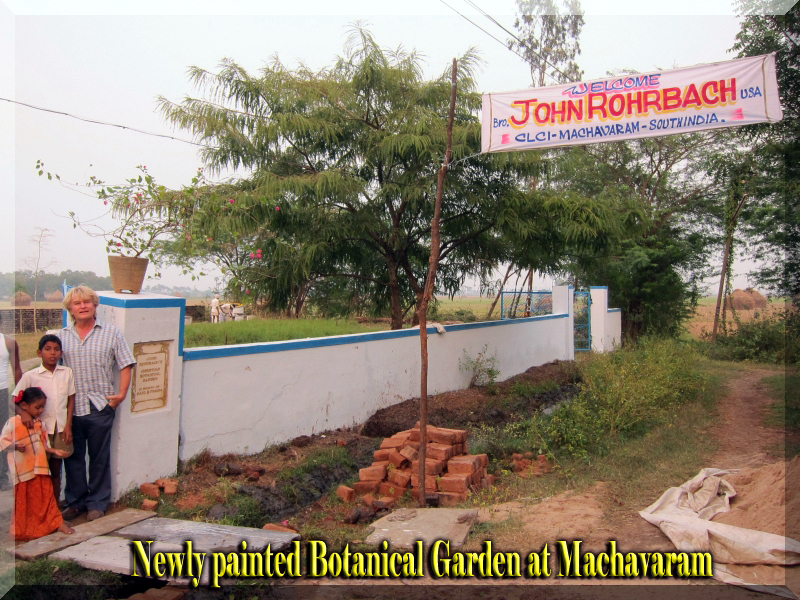 John to donate many fruit and flower plants of worth many thousands of rupees to various CLCI churches and encouraged and instructed members to develop the church gardens which would give much profit to their church as well as peace to their souls. Also it is very kind of Bro. 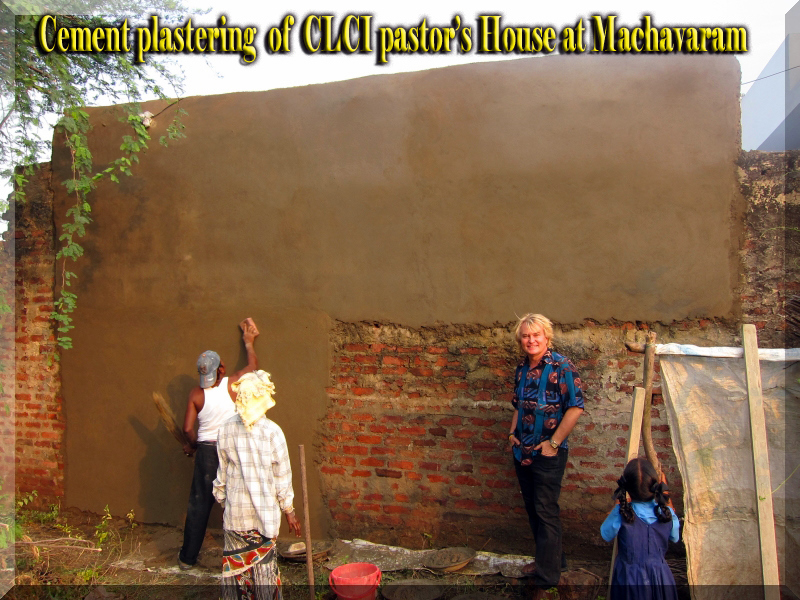 John help in repairing the house of our CLCI pastor at Machavaram. Cement plastering of walls, sunshades and wind protectors for windows, planting new fruit and flower trees in the church gardens, cleaning the garden, repairing cement benches in the Church garden, remodeling the Church-alter at Machavaram, fixing new roofs for Bathroom and Latrines, etc are some of the projects we did with the kind help from Bro. John. With wonderful financial help from Bro. 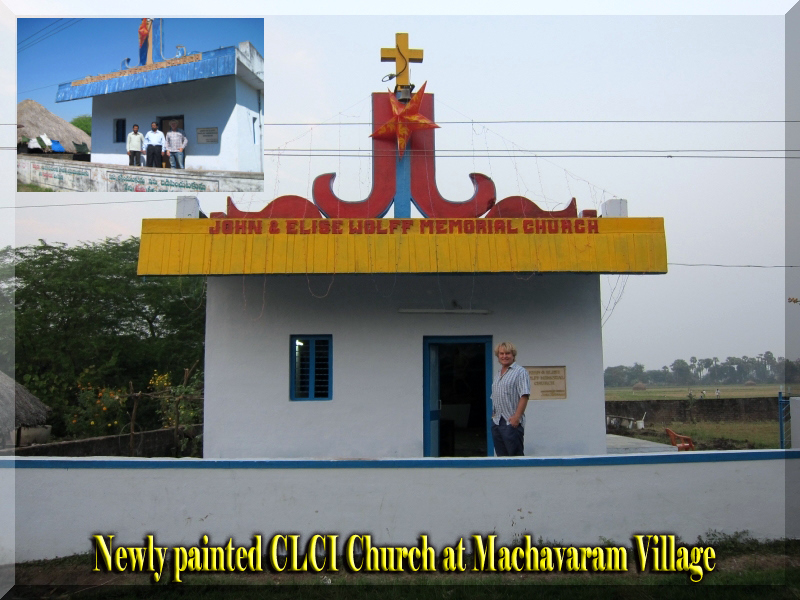 John now the CLCI church at Machavaram has drinking water facility which has overwhelmed the entire church members. The CLCI members and pastor of that congregation expressed their appreciation from the bottom of their hearts. Bro. 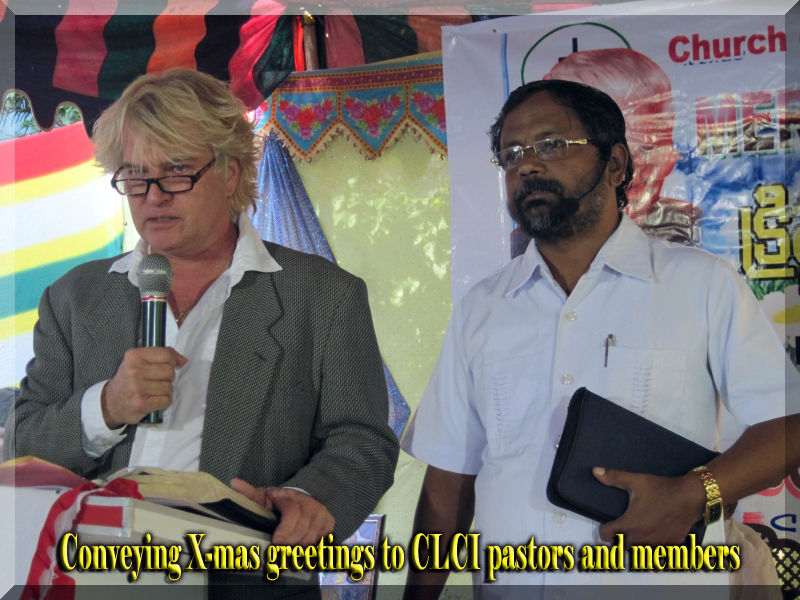 John touched the hearts of the CLCI pastors and students with wonderful words and Christmas greetings and gifts. Bro. 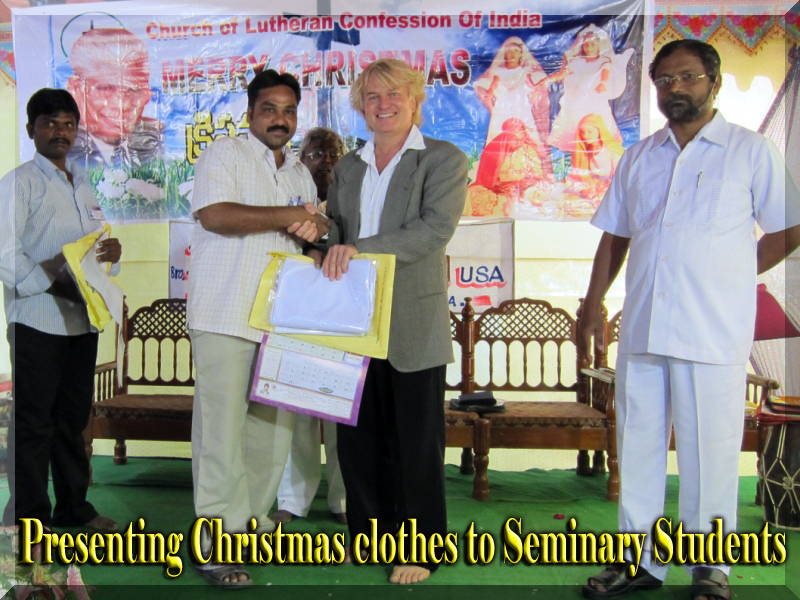 John distributed clothes to the CLCI pastors’ families and seminary students. 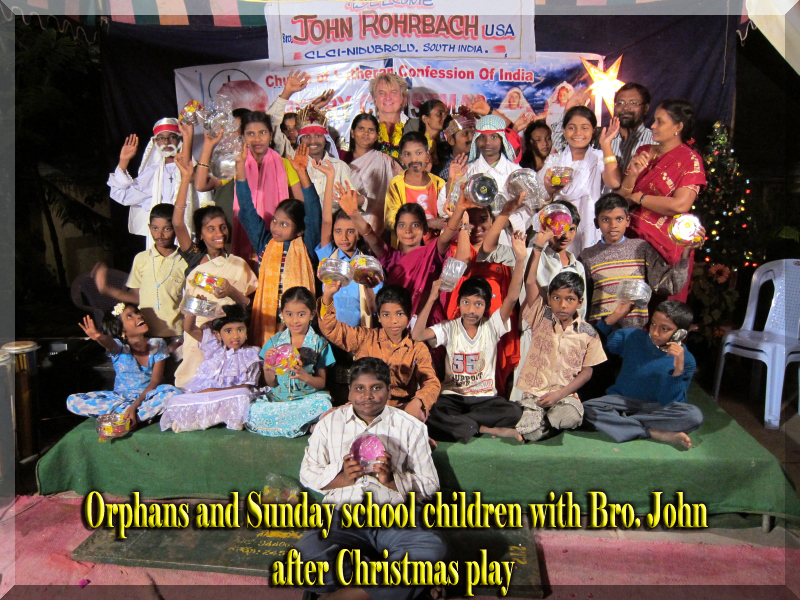 The CLCI Sunday school children and orphans welcomed Bro. John. 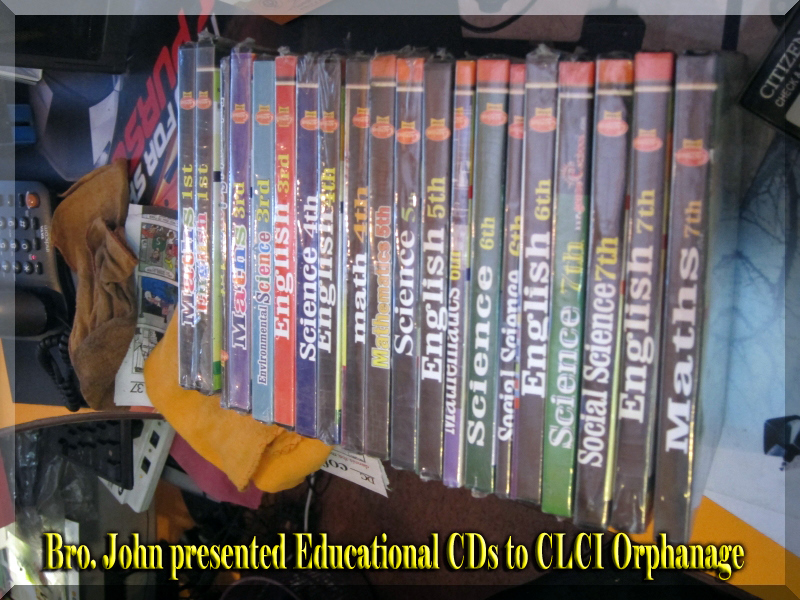 The CLCI Orphan Children have been enjoying the valuable educational CDs presented by Bro. John. All the children thanked him from the bottom of their hearts for these valuable gifts. Bro. 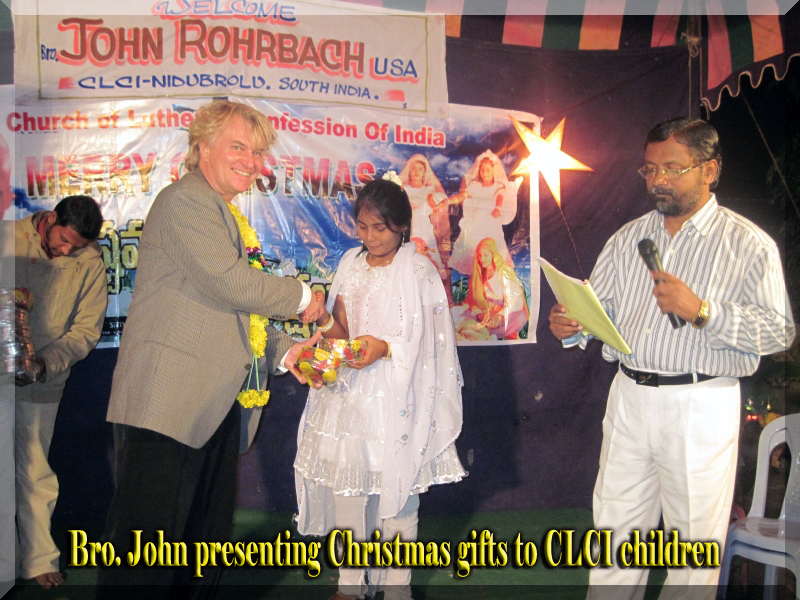 John presented many hundreds of gifts such as notebooks, lunch boxes, dining plates, pens, pencils and new testaments to the CLCI children at various CLCI congregations. 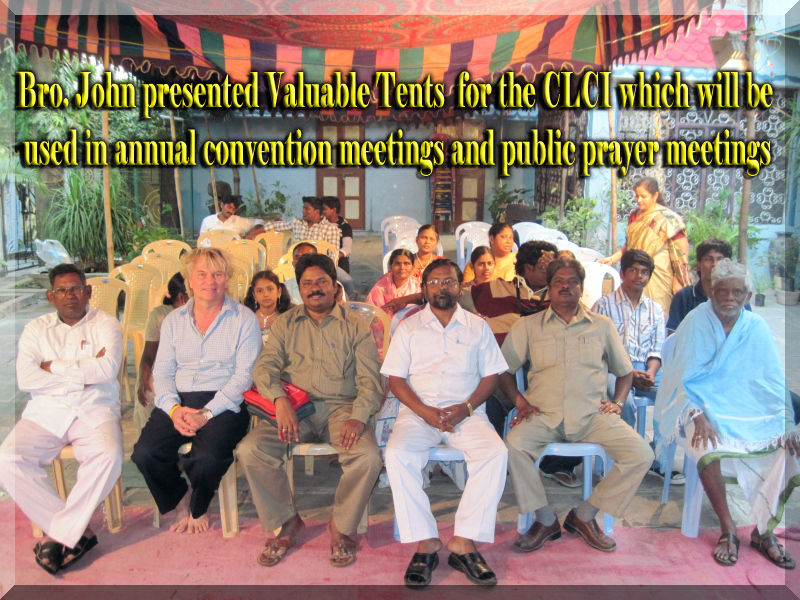 Since many years we have been using rented Tents, chairs and dining benches in the CLCI annual convention meetings and CLCI public gospel meetings. We are happy to inform you that with the generous help from Bro. John now the CLCI has its own new Tents, 50 plastic chairs and dining benches. Also Bro. 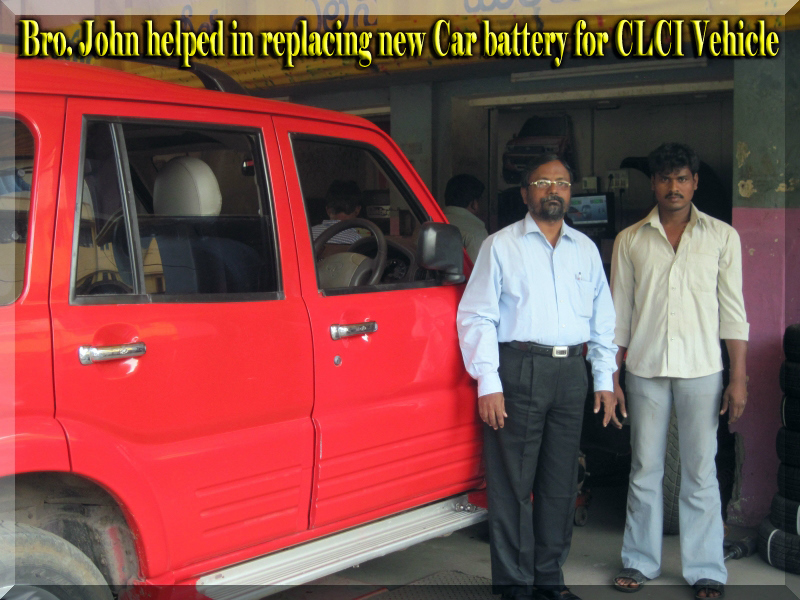 John helped the CLCI vehicle in replacing the old radial tyres, tubes and car battery with new ones. We really thank and appreciate Bro John for this because our CLCI vehicle has been traveling thousands of kilometers for the gospel proclamation. Also it is so grateful of Bro. John’s assistance in painting church gates, compound walls, pulpit, water-fountain, Water well, window grills and window doors etc. Also we thank Bro. 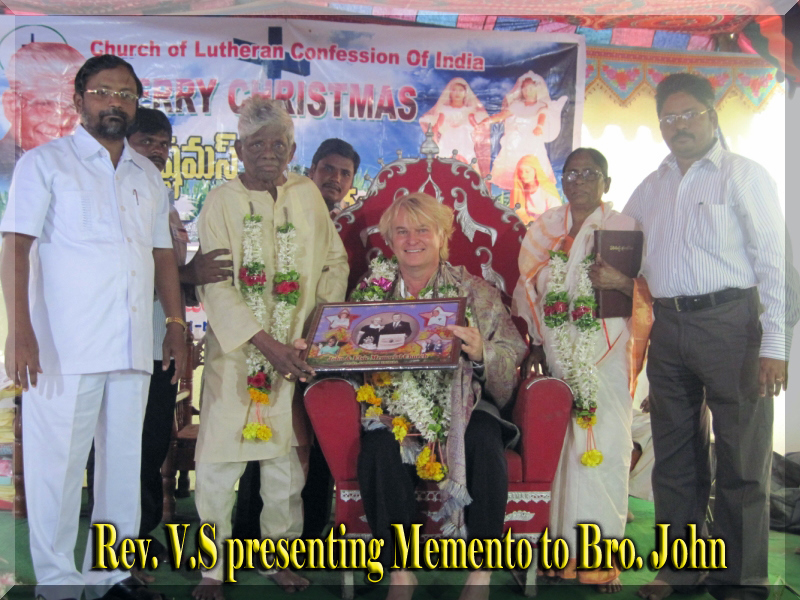 John for his kind contribution in providing the CLCI many Telugu Lutheran hymnals, Telugu Old Testament history books for seminary and Telugu song books of worth many thousands of rupees. 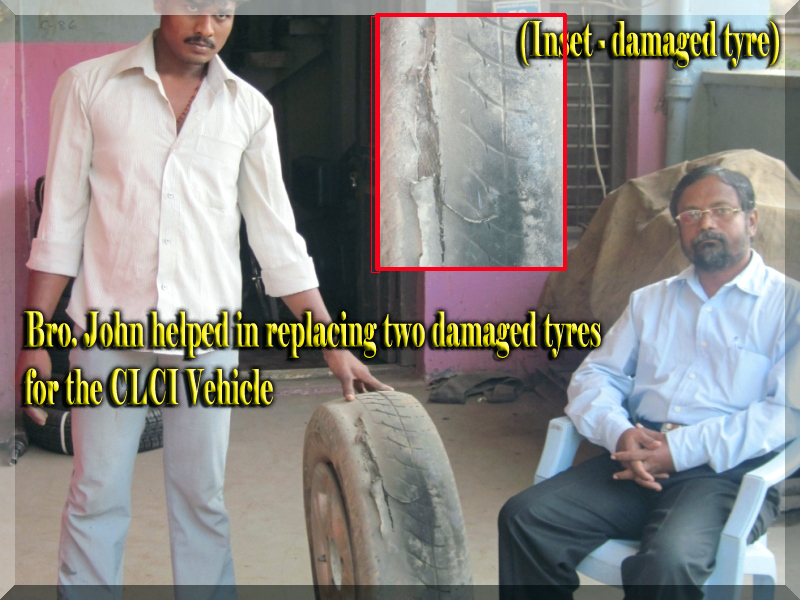 We praise God for helping us in our efforts to improve and develop the CLCI through Bro. John. This special visit by Bro. 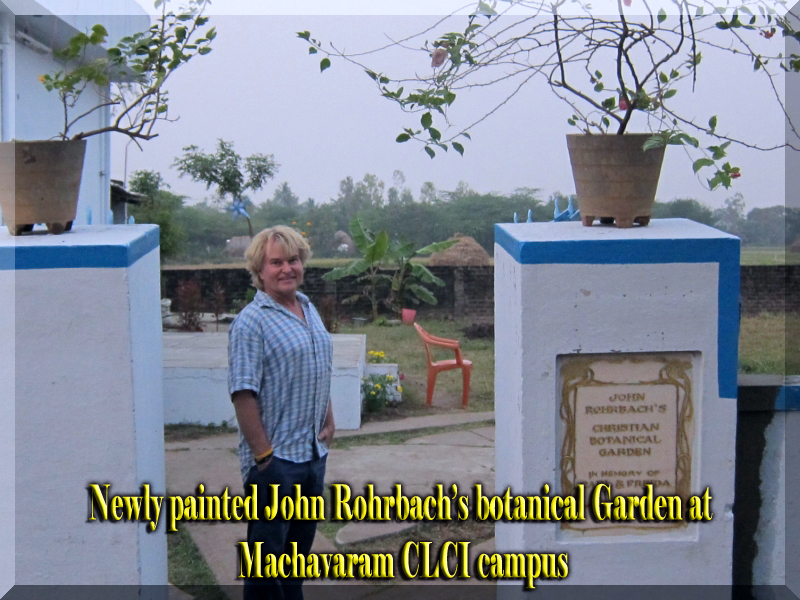 John Rohrbach became a real source of joy to the many hundreds of CLCI members. It is only by His grace and provision that we have been able to visit those villages. 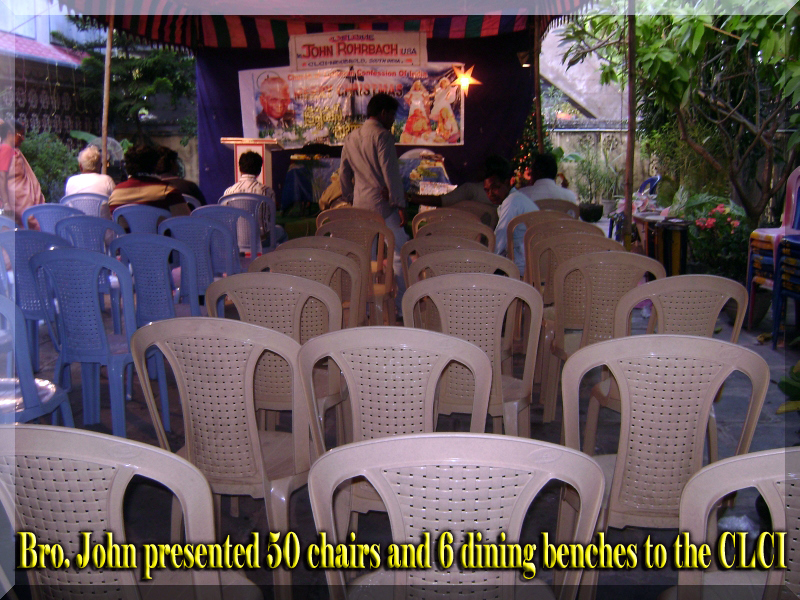 Now the members in those villages have more faith in Christ’s wonderful doings. 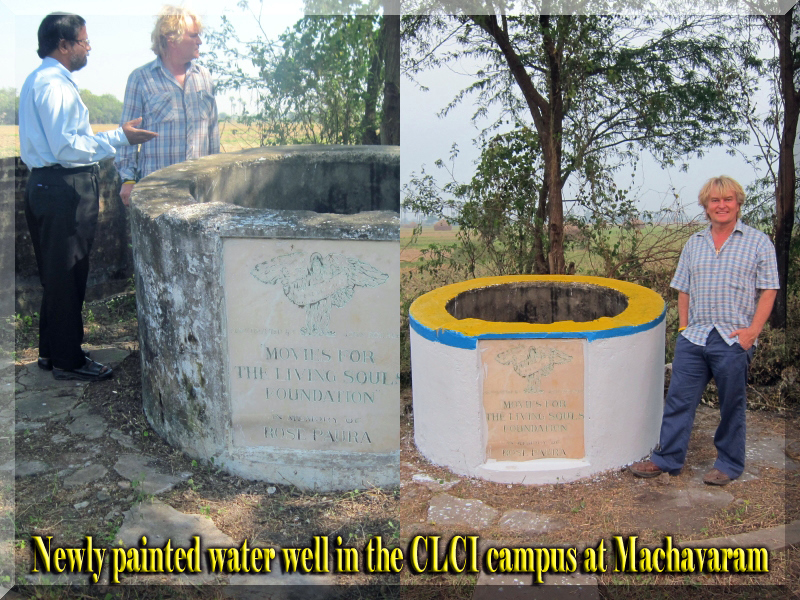 This is nothing less than a great blessing to the CLCI! As it is written, He has dispersed abroad; he has given to the poor: his righteousness remains forever. 2Corinthians 9:9. Bro. 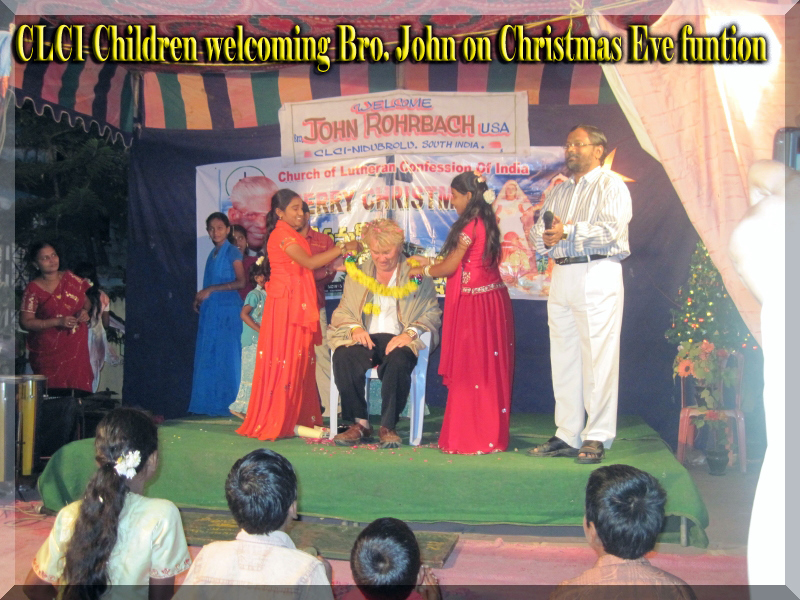 John Rohrbach left to US from Hyderabad on 4th January 2011. Bro. John Rohrbach’s visit and services enriched the CLCI in many ways. 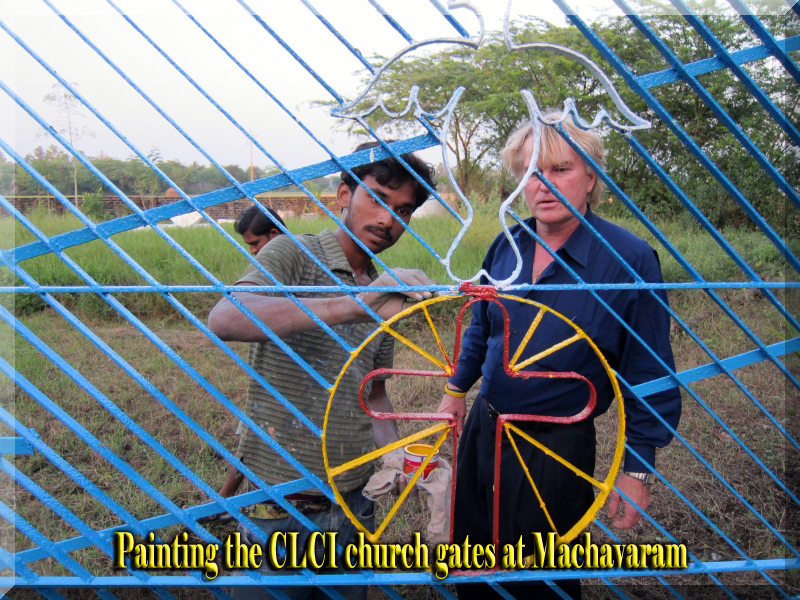 We, the CLCI pastors, seminary students, and the staff working in our CLCI ministry, the congregational members, orphan children and our family members are all praying for you and your welfare. We look forward for greater blessings of the Lord in granting us spiritual blessings and growth through many Lord’s servants like Bro. John, So that our faith in the Lord will be strengthened and His love may continue to shine in our lives as we minister to the Indian people. We request you also to continue to remember us in your daily prayers.